CAST: Jodie Foster, Sterling K. Brown, Sofia Boutella, Jeff Goldblum, Brian Tyree Henry, Jenny Slate, Zachary Quinto, Charlie Day, Dave Bautista, Kenneth Choi, Josh Tillman, Evan Jones, Nathan Davis Jr.
You have to feel bad for Drew Pearce right now; the screenwriter behind well-liked hits like Iron Man 3 and Mission: Impossible – Rogue Nation (the latter of which he obtained a story credit for) has made his directorial debut with a film that features a great cast, a cool premise, and a reasonably low budget of $15 million, yet life has still dealt him a bum hand, with critics giving mixed reactions to it and, even worse, an opening weekend gross of $3.2 million at the US box office where it finished at 8th place (sure, it debuted the same weekend as more-hyped movies like Ocean’s 8 and Hereditary, but that doesn’t diminish how poorly this movie has done with audiences). In fact, its American box office performance proved to be so disastrous that by its third weekend over 90% of cinemas in the US had stopped showing it, making it not only a financial bomb with its total gross of $6 million, but with its drop down to 163 screens from its initial 2,299 it also ranks as one of the biggest movie theater drops of all time. It’s extremely unfortunate, because here’s a guy who had a pretty cool idea for a movie, got together a solid group of actors to perform in it, got just about enough of a budget to pull it all off, and came out with a project that you can tell he had the absolute time of his life trying to make, yet most audiences just kind of let it fade into obscurity – which they really shouldn’t do, because Hotel Artemis is an extremely fun movie that deserves a little more credit than it’s been given. Set in Los Angeles 2028, in the middle of an intense riot over the privatisation of clean water (a plot point that never comes into play within this particular story, but helps set up the greedy and elitist world that this future is), a woman known as “The Nurse” (Jodie Foster), along with her cohort Everest (Dave Bautista) runs a private hospital for criminals and all-round bad people, who come to her when they sustain major injuries on the job, or just need a place to stay until they heal. On this one particular night, she has a few notable patients – bank robber Waikiki (Sterling K. Brown), whose brother Honolulu (Brian Tyree Henry) has stolen a highly valuable pen during their latest heist; sleazy arms dealer Acapulco (Charlie Day) who’s quick to antagonise anyone who crosses his path; and French assassin Nice (Sofia Boutella), who might just have an ulterior motive for checking herself in – and, much later, a far more important one in the form of notorious LA crime kingpin The Wolf King (Jeff Goldblum) who urgently needs care at his and his volatile son Crosby’s (Zachary Quinto) insistence. However, The Nurse has also made the decision to help a cop named Morgan (Jenny Slate), a figure from her past, which soon sends everything into chaos. Let’s get one thing out of the way first and foremost; yes, this has a similar set-up to the Hotel Continental from the John Wick movies, in that there’s an exclusive hotel/service for assassins and criminals, but this movie has a far different tone and approach to this intriguing idea, one that’s noticeably more comedic (to a point, because after all this is a service for killers and other scum) and also a lot more contained. That allows the movie to explore as best it can how this particular service functions and operates, from its use of 3D printers to create new spleens and livers that replace the damaged ones, to the rules that Foster’s character insists that her guests stick to, while also making it a lot of fun to be around and see once it’s in action. This is a real world-building movie, and ironically it’s all done from mostly just the one location of this old-fashioned but still believably futuristic hotel lobby; through the dialogue and how characters interact with each other, you learn a lot about this world where crime has pretty much become as privatised as the clear water that the protestors are rioting over, and you’re fascinated to see how Pearce has managed to create an entire living, breathing world while making it as fun to be in as it is terrifying in parts. It’s almost like the opposite of that first Purge movie (not The First Purge which just came out, but… oh, you know what I mean), in that there’s a fascinating concept which hints at a larger world, yet we’re mostly confined to the one place – but the key difference here is that they managed to make even its limited locations extremely entertaining. Pearce was also smart enough to lace the film with colourful characters who we can latch onto as they try and survive the night, and desperately want to see more of when the film reaches the ending credits. On one side, you have strong character actors like Jeff Goldblum, Charlie Day and Dave Bautista playing into their strengths in roles that feel like they were written especially for them, and then on the other you just have damn good actors giving it their all in roles that probably didn’t require them to give much at all, especially Foster who is just thriving and magnificently energetic in what is arguably the lead role of this ensemble movie. No matter whether you’re rooting for them or against them, the performances are so strong and kind of perfect that you won’t feel that anyone is too out of place, and they are written entertainingly enough to keep you hooked on where the movie is eventually going to lead them. I think you can already tell that I had a lot of fun with this movie, and it’s definitely worth your time if all you’re looking for is a swift and fun movie that will make perfect use of your time – and it kind of makes me a little sadder that this didn’t catch on at the box office, because I highly doubt there’ll be any sequels to this, and man do I want to see more of this world at the earliest convenience. 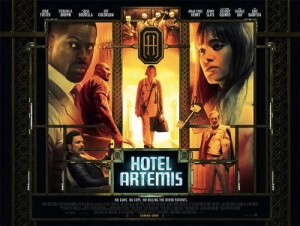 Hotel Artemis is a very entertaining ride that benefits from strong world-building and a cast of colourful characters who make things even more enjoyably, thanks to a passionate script by director-writer Drew Pearce. This is a hotel worth checking into.